Holiday World – Great Place to Cool Off! 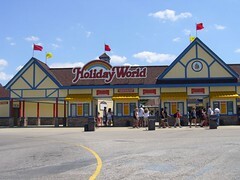 Holiday World - Great Place to Cool Off! Holiday World & Splashin’ Safari is one of the best theme parks around. Located in Santa Claus, the park is family-owned, really clean and gives you a lot of bang for your buck – or should I say Splash! They offer FREE parking, drinks, sun protection and inner tubes, besides the great ride and water fun – LOVING IT! The first half of the park is holiday themed – yes, that’s right – Halloween, Thanksgiving, 4th of July and Christmas. The rides in each area are named accordingly. For instance, The Voyage in the Thanksgiving area and The Raven in Halloween area are two wooden roller coasters that offer really fast and exciting rides! The second half of the park is all water – a lazy river, wave pool, Zinga and more. The newest addition to Splashin’ Safari is Kima Bay with seven water slides and 100 water-play elements. The park adds at least one new ride (regular or wet) annually. So, there’s always something new to do!